Miscellaneous post time, I’m not going to keep up this one a day posting thing much longer. Sure I’ve got the time, but things aren’t really that interesting round here. I aim to get this post done quickly, I’m knackered thanks to my easy ride turning into a bit of a nightmare. It looked pretty good when I set out, in fact I saw a bit of sun, then it turned out that I was pretty low on energy and then it turned out the weather was going to really turn. Spent 20 minutes hammering out a hard pace trying to get home in heavy rain. Heavy enough it actually stung on my bare arms! Then having got out of the rain, a puncture… At least it had stopped raining, but by the time I’d done the change I was cold, wet and running on empty. No gels in my pockets it was a bit of a slog home. All in all, oops. Also got in a swim this morning over at the Copthorne hotel. In keeping with the other training sessions I felt like crap, really tight and sore in my right shoulder. But hey, at least I’m being consistent in performance. Times for laps in the lake seemed really poor, but partly that’s down to the wind shifting one of the bouys 50m down the lake. The other part of it is me swimming badly after 3 weeks away from water. Someone nicked my bodyglide too leaving me with nothing to stop neck chaffing, it’s not cheap either! So now the tangents… Firstly brief book review – Peter Falk’s Just One More Thing. I loved Columbo when I was younger, still enjoy it now though it’s pretty rare to find an episode I haven’t seen, but a Peter Falk biography had limited appeal. Actually the only reason I had any interest in the book was the surprising regularity I’ve seen it being read whilst passing through airports. 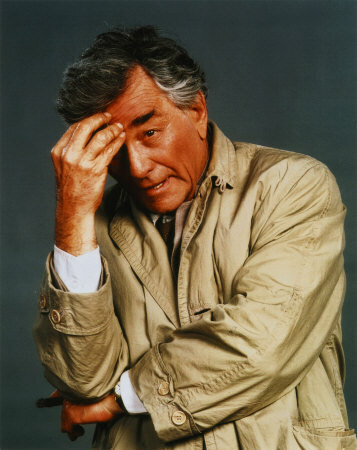 I know Columbo was popular, but were there really that many people that interested in Peter Falk. I succumbed this time on the route out to Switzerland and finished the book off whilst out there (it’s a very quick read). The brief review – it’s OK. Peter Falk has led an interesting life, he recounts bits of it as short stories. It’s not a biography in detail, it’s just highlights. I’m not entirely convinced they all stand up to outside scrutiny much as they may have been of great interest to Falk. All that said, it is enjoyable and Falk is likeable in his attitude to life. Don’t buy it if you’re interest is Columbo though, there’s not much about it in there. Actually that’s the only tangent I can think of, which is great I can have a nap before my run and dinner. I did mention writing about mental focus issues at some point, but not today. Review of the Alchemist – how to get a post out of 24 hours on a plane.